For a while now we have talked about making the change from little kid bedrooms to big kid bedrooms, and we finally did it. With tips from Target Style expert home decorator, Sabrina Soto, we planned, prepped, painted, and prettied Maddy, Owen, and Cora’s bedrooms. Now each room is perfect for a 9, 7, and 6 year old. But wooo-hoooo! 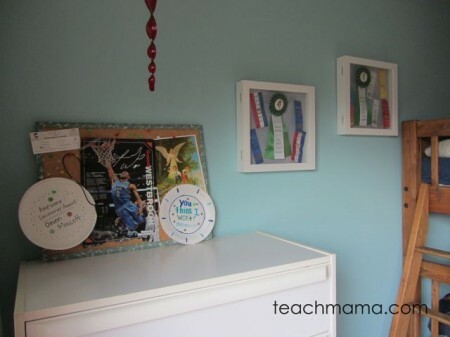 because thanks to Target, one lucky teachmama.com reader will have the chance to win a $250 Target gift card to assist with his or her own child’s room re-do! Fabulous, right? 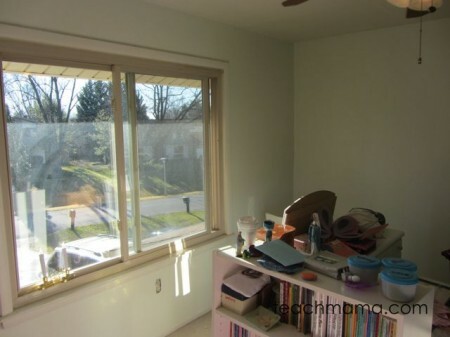 The last time we made color changes to the kids’ bedrooms was when we moved into this house, close to eight years ago. Sure, we switched out cribs for toddler beds and then bigger beds once the tiny ones became too small, but really, each room was well overdue for a new coat of paint, updated decorations, and special touches unique to each child’s style. I was surprised and excited about the options available for kids as far as room décor goes, and I’m thrilled to share what we did so that others can make simple changes that pack a big punch. It’s a big transition from baby room to bigger kid room, so let’s make it as fun as possible. How to Move From Little Kid to Big Kid Bedrooms (With Tips from Sabrina Soto): We did three rooms simultaneously, which is a bit more labor intensive, but was an easier way for us. The paint crystals added a little extra ‘wow!’ to one wall in Maddy’s room. . .
. . . which was great because we didn’t want to spend a fortune on room re-do’s. We wanted our rooms all done at about the same time. We started by talking about color. 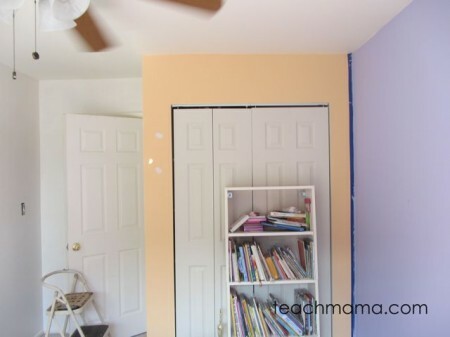 We asked the kids what color they wanted their rooms, and we gave them a few choices from that point. We narrowed their paint choices down for them because otherwise, taking young children into a paint store is more than overwhelming. It’s overwhelming for adults. 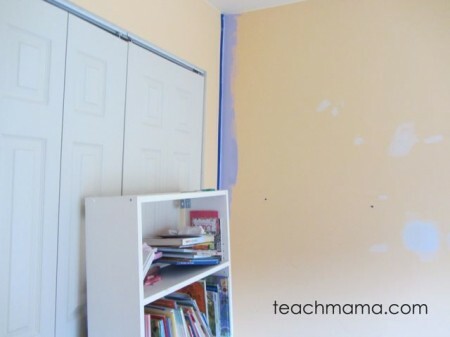 Paint is a great, low-cost way of re-doing rooms, so we thought we’d begin there. 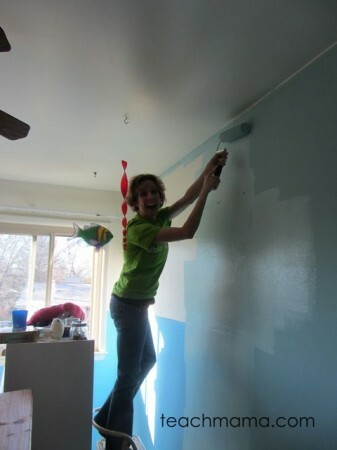 It takes a LOT of work to paint, but we had help (thanks, Aunt Mary!). . .
. . . and who knew that our Sunny Patch spray bottle would come in handy? Maddy wanted a teal color, Owen wanted blue, and Cora wanted purple. After colors were chosen, we focused on the paint job. In each room, we painted two accent walls and two white walls to keep it visually appealing and to give the rooms more of an ‘open’ feel. Half nutty after two days of painting rooms. . .
. . . and boy does the blue painter’s tape help! 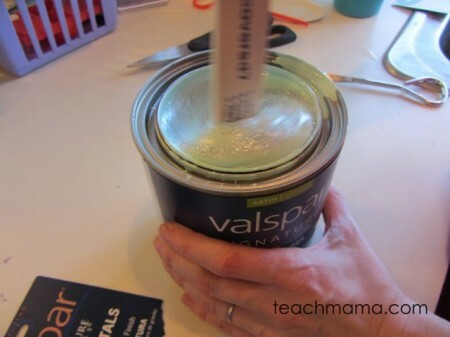 Like I said, we added Valcor sparkle to Maddy’s teal, adding the entire pack of sparkle into her one quart of teal paint. It. Looked. Awesome. 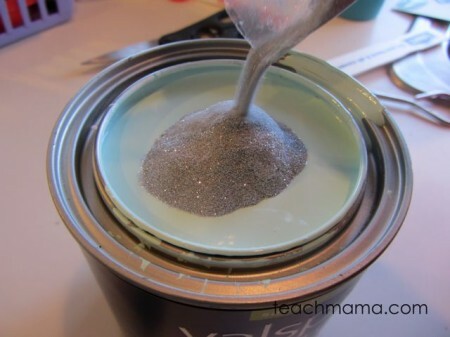 But there are tons of other glitter paint options for walls, too: Martha Stewart has a line of glitter paint for walls, as does Vesalux. We had some extra paint and decided to do some stripes on one of her walls. Adding stripes is a cool way of bringing together walls of different colors and upping the cool factor of any ‘big kid’ room! After paint we made some furniture and decorating choices, using Sabrina Soto’s recommendations. I wrote a quick note to her about each child and I sent along pictures of their rooms as ‘little kid’ bedrooms. 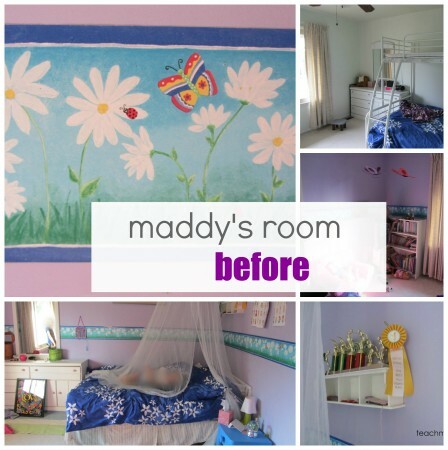 Maddy, age 9, needs a room that will take her through her “tween” years. 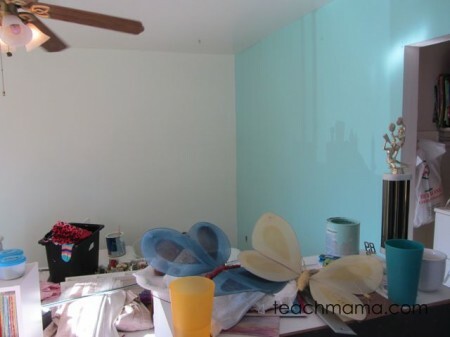 She has aqua sparkle paint on one wall, and white and purple on other. Her favorite colors are green and blue. She has cousins and friends over for sleepovers so she enjoys her bunk beds. She’s also athletic and does gymnastics and swim team. The tween years are about growing up and finding oneself. Choose pieces that show personality, yet can evolve with the child. It’s about making the room feel like their own private “grown-up” space and still infusing a fun and youthful vibe. Memo Board – memo boards are especially essential in the tween years with keeping track of activities, notes, etc. Group in 2 or 4 for larger coverage. New bedding: Tried zebra print but returned it and settled on the adorable Boho Bright bed in a bag for top and bottom bunk with pillows to match the print. 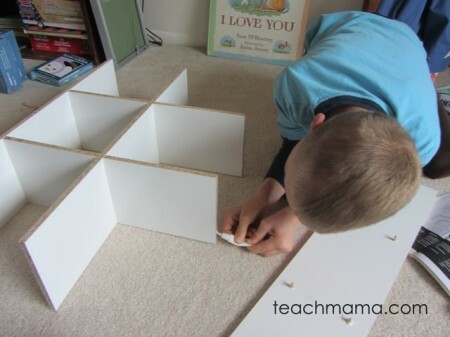 Wall Cubicles: We went with the 6-cube cubicles –similar to these–and they were so inexpensive and perfect for trophies! 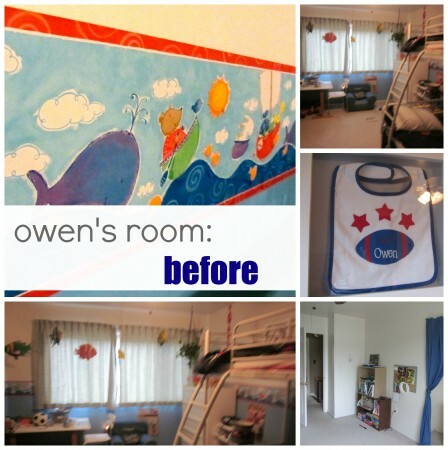 Owen, age 7, is also making a transition from a “babyish” room. He loves soccer and almost any sport. He takes a lot of pride in his trophies! His favorite teams are University of Maryland (team colors are red, white, black and yellow) and the Washington Redskins (team colors are maroon and gold). Incorporate a punch of color through accessories! A red rug or fun yellow throw pillows make his passion for the Redskins really stand out! Chalkboard Bank – a great way to get a little creative while teaching your kids about spending. Also consider a chalkboard wall, it’s fun for all ages and design schemes! 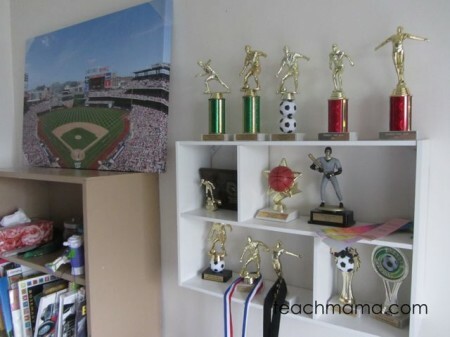 Floating Shelves – perfect for displaying memorabilia while keeping clutter off floors! Themed Wall Décor – themes can be both whimsical and fun. Shows off personality and interests! Keep it fun and personal! Picked sports-themed canvases: Both baseball-related (though we have a soccer boy on hand!) one baseball stadium canvas but with our local team–Washington Nationals–and the other with baseballs from the entire Major League. Fun accessories: We updated his shadow boxes by taking out his monogrammed bibs (they were so cute!) 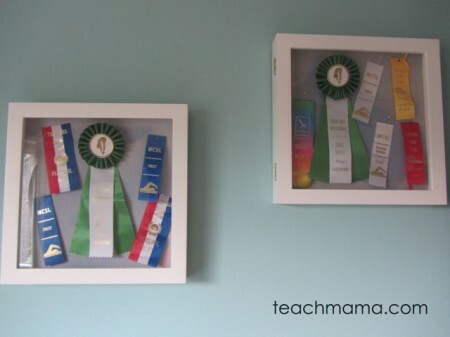 and replaced with his swimming awards and ribbons. 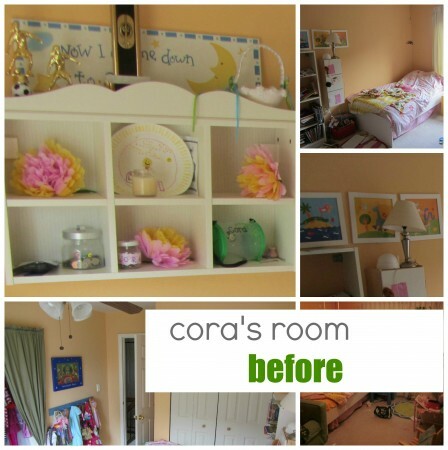 Cora, age 5, is making the transition from a “babyish” room to a “big girl room”. She is a girlie girl who loves pink, flowers, butterflies, and everything pretty. She also loves dancing and singing, keeping her room super-neat and seeking a place for everything. 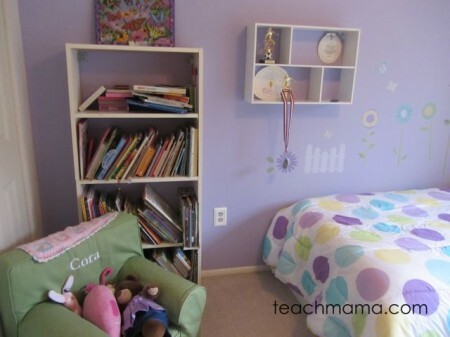 Tips for Cora’s Room: Use pieces that are “transitional” and can be used in multiple styles and ways. Girls especially change their minds about everything so it’s important to choose staple pieces that fit into multiple design schemes. Pink Window Panels – the ruffled accents are a perfect touch of girliness, simple and clean lines are great for those “transition” years, simple yet chic! Storage – girls love their accessories and trinkets! Keep everything neat and tidy in a comfy storage bench, upholstered in pink and white, perfect as extra seating for friends! Wall Decals – a great way to add a little surprise to the walls! 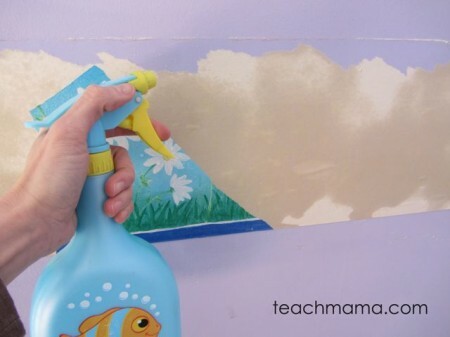 Super easy to apply and remove (helpful if she grows tired of butterflies after a while)! Big Girl Chair – perfect little “adult” accent on a smaller scale! Rocked some Wall Decals: Love, love, love these. We chose the [x] decals from the same set, and they are absolutely adorable. New photos: Gone are her babyish pictures; we flipped the print around and glued in some fancy paper–that’s it!–from her butterfly birthday bash! It was an incredible experience, from start to finish, especially because Maddy, Owen, and Cora were a part of every decision along the way. For everyone, it was an absolute blast–and it certainly made this rite of passage, the move from little kid to bigger kid room, a whole lot more fun. Let’s get to how YOU can bring all of this fun home to your kiddos! 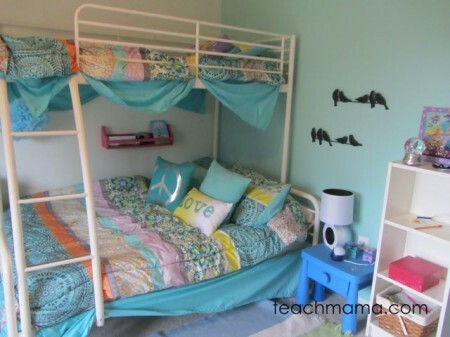 Do you want to win your OWN $250 gift card to Target for your OWN kid bedroom re-do?! Ummm. . . of COURSE you do! By entering this super-fab giveaway, you are demonstrating your understanding of and compliance with the Official Sweepstakes Rules. This giveaway ends Friday, April 26, 2013 at midnight ET. Winner will be chosen by ‘Rafflecopter’ and will be notified on or around 4/26/13. Winner must respond within three (3) days of notification or forfeit the prize, in which case an alternate winner will be selected. All Official Sweepstakes Rules apply. 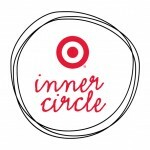 fyi: I wrote this post as part of the Target Inner Circle program. As always, my opinions are all my own, influenced only by my experience as a parent and educator–and, of course, my three little room-re-decorators. Our challenge is that we have moved all 4 of our kids into one room. 3 boys, 1 girl. It’s fairly neutral because it was the girl’s room and we did yellow with just nice art in there. But it would be cool to make it a fun, funky space. Our boys’ bedroom/playroom is due for a change – this would be perfect! I liked the tip about choosing items that can be used in many different ways and serve them as they grow. Love the paint tips! I’ve always had an issue with painter’s tape and making borders! What a wonderful looking room. I want to do that kind of stuff for my kids, as well. 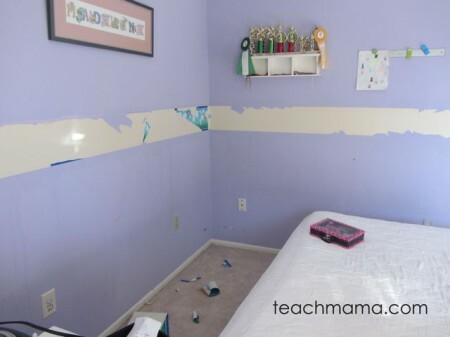 My challenge: living in an apt with a too-small kid’s room and walls we can’t paint. 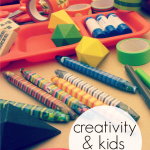 These are great ideas – my kids are similar in age to yours and then I have a 3 year old. We are still figuring out who sleeps where so while I have a boys room and girls room eventually I think I need to separate the boys – they are growing so fast, I don’t want to make the wrong decision! They enjoy each other’s company so they really don’t want to be alone.. maybe this summer we will figure it out. I find it hard to find functional storage solutions for toys. I need something that is easy enough and accesible for my little ones to keep their toys neat. What great ideas! I especially liked the different ideas for storage and display space, and the sparkle paint, which I did not know even EXISTED. We are in the midst of planning to redecorate the bedroom that my daughters share. The biggest challenge is that they are exact opposite in personalities but at the same time I want a little bit of cohesion in their room. I love how some of Target’s comforters can be reversed to be coordinating but not the exact same pattern (like the Girls Mix & Match bedding set). That way I can still have the room look coordinated but they can let their own personalities shine through and not have to have the exact same bedspread, etc. I love the storage ideas. Michael has too many toys. My challenge is decorating to where it will last years and they won’t outgrow it too quickly. 🙂 I love your wall cubicles! Those wall cubbies are fab! Lucas has so many “special” things he wants to keep out on his dresser or nightstand but those surfaces are getting really cluttered! I love the cubbies and shadow boxes for awards and trophies! 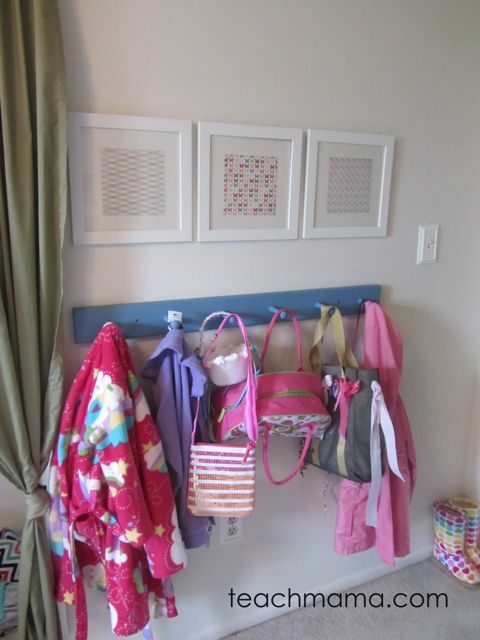 I’ve been looking for a shelf like the pink one on the wall of Maddy’s room next to the lower bunk. I would love to know where it came from! Oh its all so nice! I really love the Wall Cubicles!!!!! What a neat idea!!!!!!!!!!! 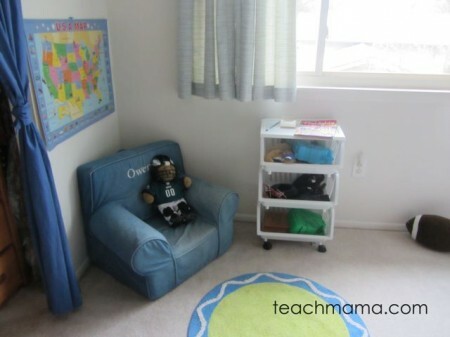 I would love to redo Carters room! We just moved him recently out of his crib to a toddler bed, and would love to make it more of a little boy room! I like the idea of grouping 2 or 4 memory boards together! This would work well in my teenagers’ room! I like the tip about transitional decorations. My daughter is almost 7 and we will be moving into a new home soon. I think that transitional decorations can be easily swapped out later as she reaches her tween years, while keeping a similar color scheme and design. I think the tip of keeping it personal is the one that struck a chord with me. I’ll be moving my son up from a crib to a toddle bed (he’ll turn 2 next month) and we’ll be updating his room – these are some REALLY great ideas!! thanks!! Love the tip to remove borders! I love the storage tip, storage is always the hardest thing for me when decorating bedrooms. I love the shelves for storing/displaying trophies. And some new comforters would be amazing! I would love to redo my 3 year old son’s room, but I want something that will last a while. I love the tip about adding wall decals. It adds so much character and doesn’t leave the walls plain or boring. Such great ideas! Our daughter is do for a change in her room. 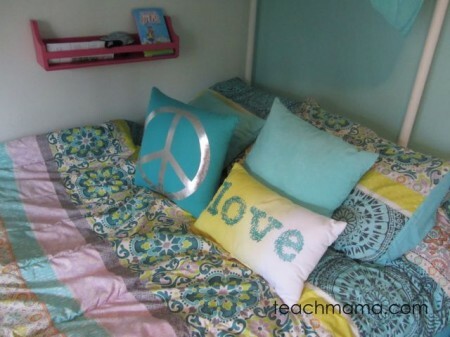 We’re into the tween years now and re-doing her room would be a special treat! I like the cubicles for trophies. Thanks for the tips! We are looking at transitioning my daughter, but I don’t want to spend a fortune. You had some great ideas! My biggest challenge is clothing storage. I want something easy for my 4 year old to use that doesn’t look messy. Right now we have cubes in his closet but it’s basically just a bunch of piles. I love the ideas you put in here. I love the cubicles! We use them as well! When we transitioned to a big kid room, we also moved the boys in together. That meant we needed more storage space for clothes. My second son is perpetual motion and a climber, and I worried about safety concerns with 2 dressers or a heavy one. I solved the problem and saved space by using IKEA Hemnes shoe cabinets. The boys roll their clothes and put them away themselves. The shoe cabinets are bolted to the wall (no falling on kids). My boys can see all their clothes at once and don’t have to dig for them (so it stays organized). It has been a perfect solution for space and safety! I think the advice she gives to buy things that can be used in multiple ways is always sound advice. Love it! Wow! Their rooms look great. I love the bedding in both of your girls rooms.. such bright colors! My baby is getting read to move from a toddler bed to a big boy bed and I can’t believe I’ll have two in big boy beds. Which makes me a little sad and a whole lot glad! I like the wall cubicles. We never have enough places to put all their precious little things. Great job! You must be EXHAUSTED, but I bet your kids are thrilled! We just repainted one of our kid rooms and covered all the crayon marks and stuff. It was a little sad, but it looks so much better! We are working on re-doing our kids’ rooms and storage is always the hardest thing since our boy’s share a room. We have a 7 and 4-year old in one room and a 2 year old that will soon be sharing a room with his baby brother. I love the painting tips and would love to try adding some stripes to their walls 🙂 Thanks!! I would love to spruce up my kid’s bedrooms. We moved to our house last summer and the kids room have remained unchanged. They definitely need a sprucing up! I really like the tip about glitter paint. I didn’t know that was available! Definitely looking into that, and, my biggest challenge? Keeping it age appropriate for NOW and next 3-5 years. Oh you make it looks so easy! 😉 Wall stickers are my favorite things! We recently did the same type of project. Well done! I think the paint tips are the most helpful! Love the look. My 3 y.o. son and 6 y.o. daughter share a room, so my biggest decorating challenge is appeasing both of them. 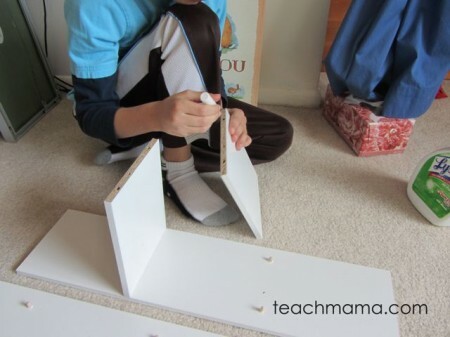 My biggest struggle is finding pieces that will look good in the kids’ rooms and help me with clutter. I prefer it all to look like it’s “away” but if it’s too hard a system to keep up with, it doesn’t work for the kids. Love the tip about using punches of color. It definitely makes it more visually appealing (and will help camouflage the clutter when that inevitably happens!). 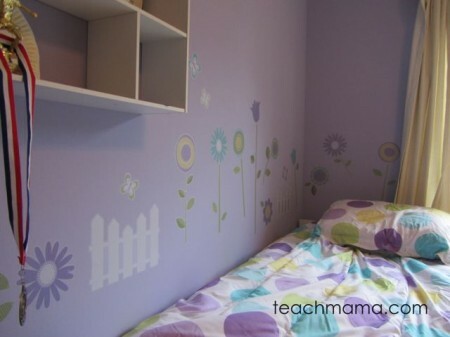 I love them all but Cora’s room is so my style – beautiful job! Our biggest challenge is always storage – books and off season clothing is always a struggle for us. I love the little girls room – I think my 7 year old is ready for a big girl room too. Having a 5 year old myself, i liked her tips for Cora’s room. We still have a toddler bed… Need to change that! And have to agree, she loves to be able to change things around. My biggest challenge is finding something that makes everyone happy. My DH is super-picky and hates EVERYTHING and doesn’t see the point in decorating a space. My 12yo is ambivalent about everything and also doesn’t see the point in taking the time to make changes to anything. I tried to talk him into painting his room a few months ago (it hasn’t been painted since like 1988) and he didn’t want to do anything because work would be involved. Sigh. All the rooms look AMAZING! I really love your painting tips and the paint glitter is way awesome! 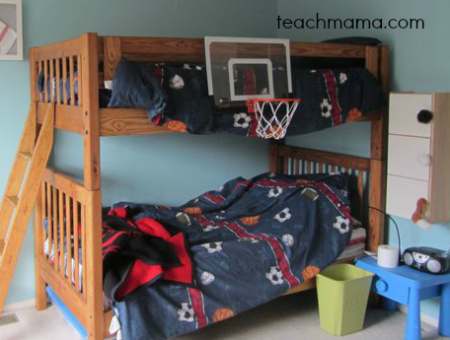 We just re-did our boys’ rooms… if I could just get around to posting them! You did a great job–they look awesome! Love how Owen still uses his Anywhere chair. I need help organizing all the toys my girls have! I can’t seem to find spots for them! 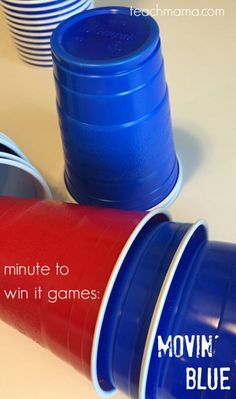 I have four kiddos in two bedrooms and my biggest challenge is organization – the kids need a place for everything they have and in such small rooms, that is quite a challenge. We just did this for A and R. The painting has yet to be done but we could definitely use the help with organizing and making it a bit prettier. Our biggest issue is space! We have two kids in each room, so space is limited. I cannot even imagine how much work that was all at once! The rooms turned out great and I bet all three are thrilled. 🙂 Thank you for such a wonderful giveaway! I love the organizing tips. That is my biggest problem – de-cluttering. But I’m getting better at not shopping as much and giving away things we don’t use or need. Beautiful happy colors. Love it. Our biggest challenge is space! I still have my twins in one room and there just isn’t enough space for all their clothes. I always look for creative, cute and functional storage ideas so I love the cubes hanging on the wall to get display things OFF the dressers! Love the wall decal tip. My biggest problem is finding what I want on budget! My biggest problem is organization in the kids room, even when the rooms are cleaned nicely, things still don’t look as nice as I’d like, because some things look out of place due to not having a better organization system that fits into the design of the room. 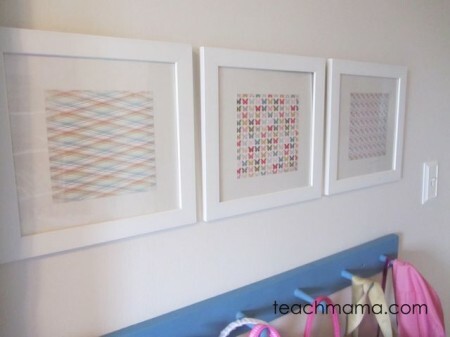 I liked her tip of using the kids’ personalities in the room and to chose pieces that can transition with them. My biggest challenge is that I have 3 daughters in one room, their amount of “stuff” is overwhelming! I like her suggestion of a chalkboard wall. I think my child would enjoy that. great post! 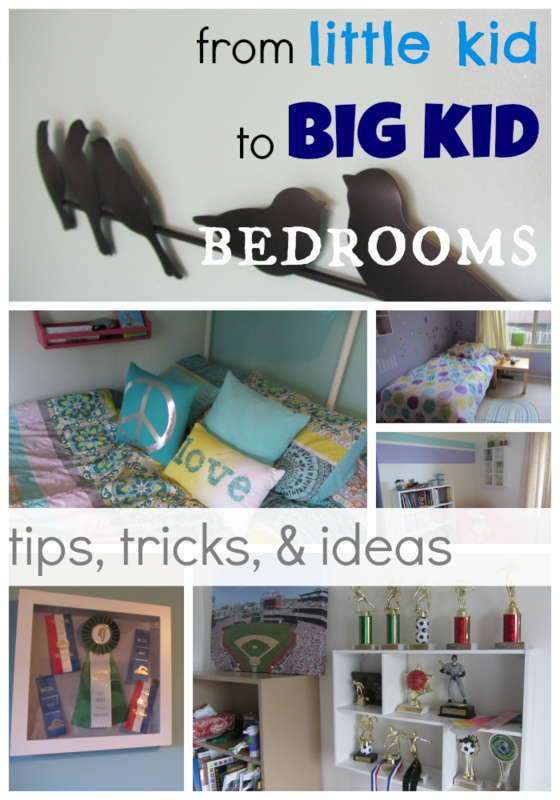 love the ideas – just wondering what sizes your kids’ rooms are? We live in your general vicinity & my childrens’ rooms are tiny, which makes space planning (especially with big bookcases!) a challenge. thanks, Emma–good question. Should have totally shared that but didn’t even think about it! Maddy’s room is large–I’ll tell you that right off the bat, and Cora’s is teeny. I’ll measure them tomorrow when the kids are awake and get back to you. 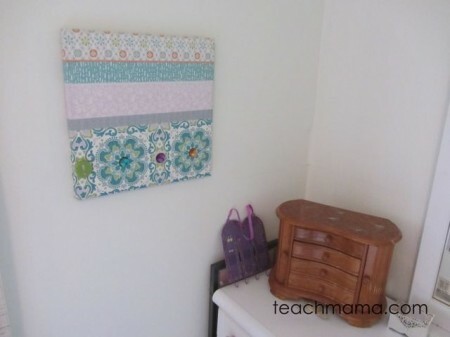 I love the idea of choosing pieces that show personality but can grow with the child. It’s important to find transitional pieces so you aren’t redoing the room in another few years! Oh, and my biggest decorating challenge is the master bedroom. I don’t know how to do masculine and romantic at the same time. My biggest tip is to start out with more grown-up pieces and not make the room quite so “baby-ish”. This is what I did for my son and what I am currently doing for baby #2 on the way! Yes, we have a crib, which converts to a toddler bed, which then converts to a full-size bed. As long as you purchase quality furniture the bed and dresser will last for years. When choosing colors or themes, pick ones that will work for several years/ages. For my son we went with blues and brown and a vintage aviation theme (and didn’t go overboard with it). For baby #2 we are going with yellows and grey and a jungle theme (but only lions, giraffes, and rhinos) again picking more modern lines/images and using them as accents rather than in-your-face.